The European Union's fine against Alphabet subsidiary Google for giving itself an "illegal advantage" in search has opened the company up to litigation from impacted Internet companies in Europe. Nearly $2 billion in lawsuits are pending, but the CEO of one of the companies suing Google warned a "tsunami of litigation" could be facing the company. My site remains bullish on Alphabet, but I present two ways shareholders concerned about this litigation can stay long while limiting their downside risk. 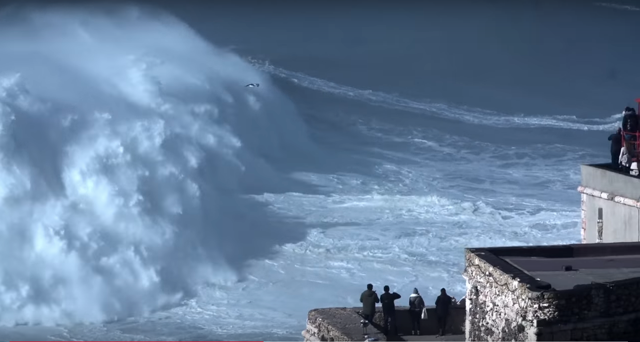 Watching an 80-foot wave break during Rodrigo Koxa's ride at Nazaré, Portugal. (via YouTube). Google Facing A Litigation "Tsunami"
Google's anti-competitive practice devastated an entire market... it is therefore not surprising that Google is facing a tsunami of litigation. My site is currently bullish on both classes of Alphabet shares, based on its analysis of total returns as well as options market sentiment. That said, with Google facing lawsuits from these price comparison sites, as well as potentially from other browser and search engine companies, some Alphabet longs may want to limit their downside risk. We'll look at two ways of doing so below. 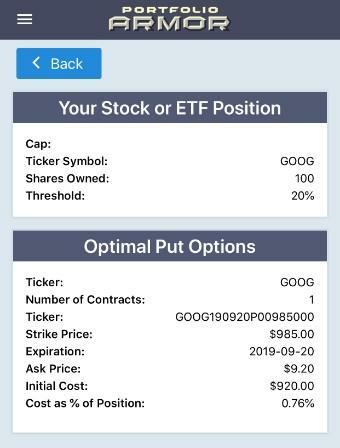 For these examples, I'm assuming you have 100 shares of GOOG and can tolerate a decline of as much as 20% over the next several months, but not one larger than that. The screen captures below are via the Portfolio Armor iPhone app. 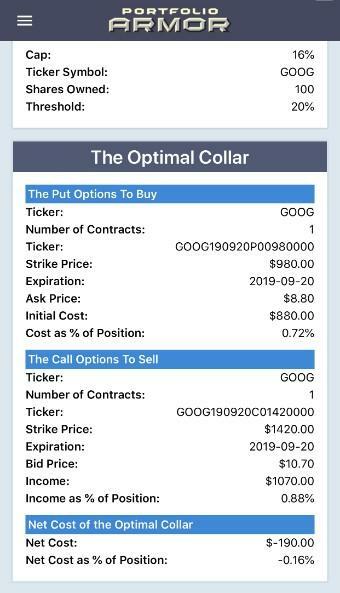 As of Friday's close, these were the optimal, or least expensive, put options to protect 100 shares of GOOG against a greater-than-20% decline by late September. To be transparent and accountable, I post a performance update for my Bulletproof Investing service every week. Here's the latest one: Performance Update - Week 72.